Tea Party politician of Cuban descent who became the first Hispanic, and the first minority to be elected a U.S. Senator from Texas in 2013. He became the vice-chairman of the National Republican Senatorial Committee in 2012. In 2003 he became the first Hispanic Solicitor General in Texas as well as the youngest Solicitor General in the United States. He was a major force behind the U.S. government shutdown in 2013 and filibustered a resolution designed to fund the government with a twenty-one hour and nineteen minute speech because he disagreed with Obamacare. 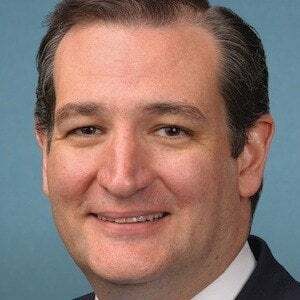 He has two daughters named Caroline and Catherine with Heidi Cruz, whom he married in 2001. The couple met while working on the George W. Bush presidential campaign of 2000. His filibuster was criticized by Senate Republican leader Mitch McConnell.